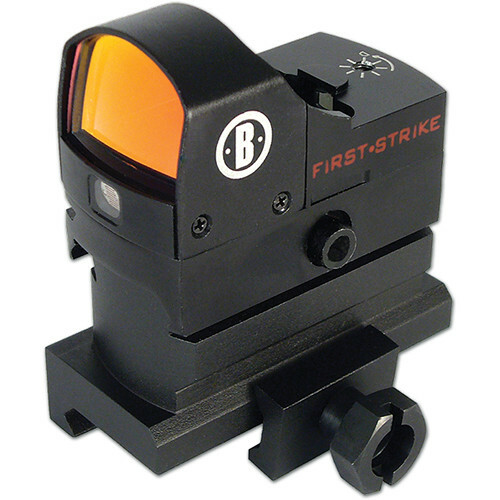 The AR Optics First Strike HiRise Red Dot Sight from Bushnell is a lightweight tactical optic for close-range targeting. This AR Optics series sight features a 5 MOA red dot with self-regulated brightness level that automatically adjusts to the ambient lighting condition. This model from the AR Optics series is configured with a built-in Weaver rail mount that is engineered for shock-resistant performance when correctly mounted atop an AR-style rifle. The unmagnified optics have multiple layers of Bushnell's Amber-Bright high contrast coating for enhanced image quality and improved target acquisition in low light. The unlimited eye relief further equips the First Strike HiRise for the quick target acquisition needed from a tactical weapon system.